Man, I just love a good Italian sub. All of those spiced meats, oregano, cheese, and peppers can really hit the spot sometimes. Now imagine taking some of the best ingredients in an Italian sub and throwing them on a thin, crispy pizza crust and baking them to perfection in your oven. That's basically what we have here. I've never tasted a meat that blended so perfectly with banana peppers as this Genoa salami did. 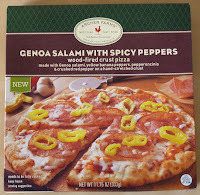 The cover of this product mentions both "banana peppers" and "pepperoncinis," but I was pretty sure they were the same thing. You know, you always get them at Subway. Most locations label them as banana peppers, but regionally, they're also known as pepperoncinis. I certainly didn't see two types of peppers on top of this pizza, but enough with semantics. This pizza tasted great. It also has whole milk mozzarella cheese, tomato sauce, and crushed red pepper already on it. 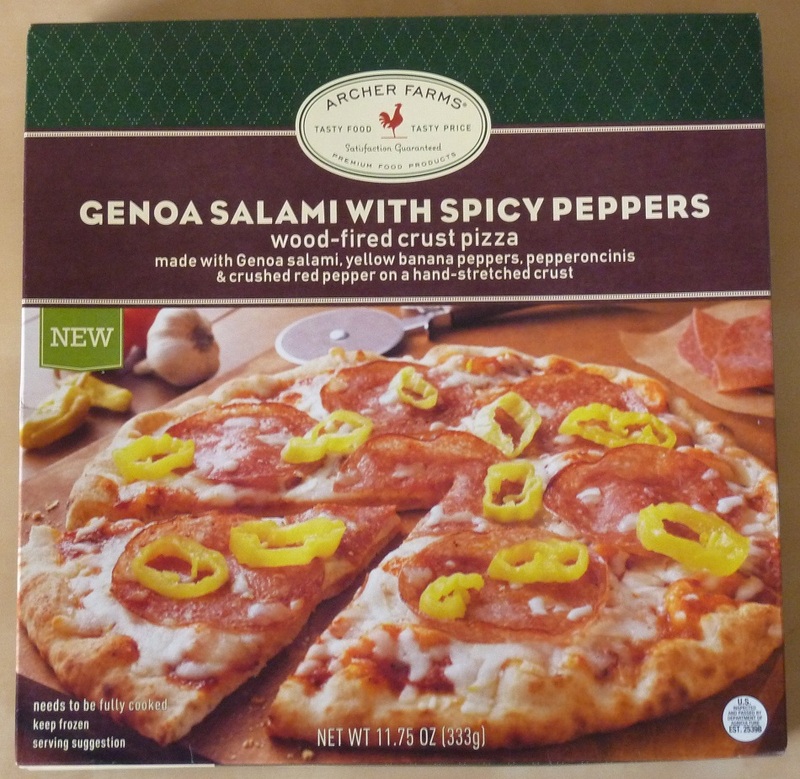 Altogether, the two shining stars of this product are the pepperoncinis and the salami. You could throw a bit of those two ingredients on plain white toast and it would taste pretty good, in my opinion. The cheese and tomato sauce are present, and they certainly don't hurt the flavor, but they don't do a whole lot for it, either. Mozzarella is generally a mild cheese, and maybe AF's food gurus knew what they were doing when they made sure it played second fiddle to the meat and peppers, but I'd be very interested in finding out what this product would taste like with a bolder cheese. The crust seemed crispier and less chewy than many other AF pizzas. I don't know if that was solely because we cooked it a tad longer or whether the crust is actually made differently in this pizza. Either way, it was pretty close to "New York-style" and it worked well with the toppings. My wife and I both agree, this is tied for the best Archer Farms brand pizza we've had so far. We'll put it up there with the Eggplant Parm. I give this pizza 8 out of 10 stars. After reading your review, I was excited to find this pizza in my local store. The salami and banana peppers were great. Unfortunately, this pizza had so much red pepper flakes on it I couldn't enjoy or continue eating more than once slice since my mouth was on fire and my nose was running to much. Bummer, because this was a pizza I would enjoy otherwise. Really!? I don't remember that many red pepper flakes on mine. But I probably would have liked it that way. I like-a the spiciness!